There’s nothing better than a hot, fresh cup of your favorite coffee -- and there’s no easier way to get it than single-cup coffee makers! Single-cup coffee makers like Capital Coffee’s Van Houtte, Starbucks, Keurig and Flavia systems give clients, customers and employees alike the ability to brew up a cup of joe just the way they like it. No more stale, cold pots of office coffee -- reward your hard-working team with the gourmet convenience of a single-serve coffee brewer. Read on to learn more about our Van Houtte one-cup coffee brewers as well as our Starbucks single-serve office coffee system or visit our Keurig and Flavia pages for more information about the other single-cup coffee makers available from Capital Coffee. 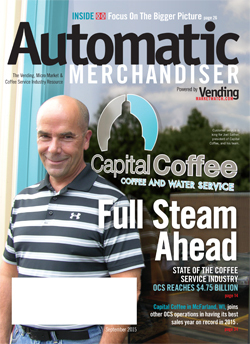 At Capital Coffee, we’re proud to be one-cup office coffee service provider trusted by workplaces across the Madison and Milwaukee, WI metro areas! Brew exceptional coffee and today's most popular hot specialty beverages - at the touch of a screen. The Excellenza Touch with its high-definition user-friendly 10.1" touchscreen, simplifies the beverage selection process, offers the freshest cup of coffee possible and a wide variety of specialty beverages - all this, ground and brewed to perfection in seconds. Great coffee for even the most discerning coffee connoisseurs. This one of a kind, revolutionary new brewing system alleviates mess and clean up, while ensuring the convenience, consistent taste and quality for which VKI's single cup brewing systems are renowned. Ready to learn more? Click here for detailed information about the Excellenza Touch coffee maker. For coffee shop selection and on-site convenience, there’s no better one-cup coffee system than the Latte Lounge. This renowned brewing system will make quite the impression on clients and employees alike, cup after delicious cup. A bean-to-cup coffee maker, the Latte Lounge grinds and brews gourmet coffee exactly to your specifications, so each individual can indulge their unique preferences. Choose from three cup sizes, three brew strengths, caffeinated or decaf, cappuccino, cafe latte, tea, hot chocolate -- it’s up to you! The Latte Lounge features three coffee bean hoppers, so you can choose from three bean selections to customize your cup. Plus, with a graphic interface and wireless programming capabilities, the Latte Lounge is the industry’s most advanced and easy-to-use single-cup office coffee makers. For more details on the Van Houtte Latte Lounge, click here. The Latte Lounge Express is gourmet office coffee at its most convenient! Ground and brewed on the spot, one cup at a time – there is no fresher cup of gourmet coffee available. For more details on the Latte Lounge Express, click here. Besides brewing up delicious coffee and specialty beverages, this office coffee system is also eco-friendly. Your Latte Lounge Express uses on average 80% less packaging material than coffee brewers with disposable pods. Plus, this single-cup coffee maker uses no paper filters. Great coffee and a clear conscience -- it’s a win-win! With the Latte Lounge Express, there’s something for everyone. This single-cup coffee maker offers the same specialty beverage selection as the original Van Houtte Latte Lounge, including cappuccino, mochaccino, hot cocoa, cafe latte, cafe mocha, tea and more. Suprema coffee system offers single-cup gourmet coffee combined with push-button convenience. Choose from a one-cup or carafe option, three brew strengths, three sizes and several specialty beverage options -- whatever you select, you’ll have a hot, fresh cup of coffee in a matter of seconds! You don’t have to send the intern on a coffee run in order to have delicious Starbucks coffee in your office. Capital Coffee is proud to offer the Starbucks Interactive Cup Brewer, a single-serve coffee system designed to deliver that unmistakable Starbucks taste day after day, cup after cup -- in the comfort of your own office! This fully automatic bean-to-cup coffee maker features two whole-bean hoppers so you have your choice of your favorite Starbucks blends any time of day. Just select your coffee blend, cup or carafe size and relax -- the Starbucks I-Cup Brewer will grind, brew and serve up your gourmet beverage in a matter of seconds! For more information on the one-cup Starbucks office coffee maker, contact us.